Waterjet Cutting | Quality Fab Inc.
At Quality Fab Inc. we specialize in customization and with waterjets, we are capable of cutting virtually any material, any shape or size. The process is very simple, yet very powerful. We have 6’x12′ table capacity to assist you with a wide variety of projects. 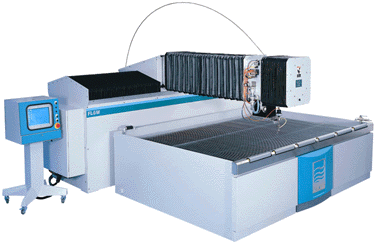 The waterjet utilizes a stream of water that is generated by an ultra-high pressure pump. The pressure of the stream used is rated up to 50,000 PSI. To put that number into perspective, a fire hose contains 390 to 1,200 PSI. The highly-pressurized water is channeled through a small jewel orifice, which creates a narrow stream that can precisely cut through soft materials. In order to make the stream more powerful, garnet is pulled into the supersonic waterjet stream. The water and garnet exit the cutting head at nearly four times the speed of sound. Adding garnet to the water increases the power by 1,000 times, making the stream capable of cutting through steel that is over six inches thick.